Recently, Sustainable Renton hosted an excited group who were eager to learn more about the nuances of permaculture. Laura Sweaney was kind enough to share the knowledge she has obtained from two decades of experience in the field. The seminar drew a sizeable crowd at the offices of Sustainable Renton which focused on strategies for individuals to implement at home, including: sheet mulching, composting, zoning and layers, hugelkultur, herb spirals, and plant guilds. The ethics of permaculture stress a holistic approach of limiting consumption, caring for the earth, and caring for people. 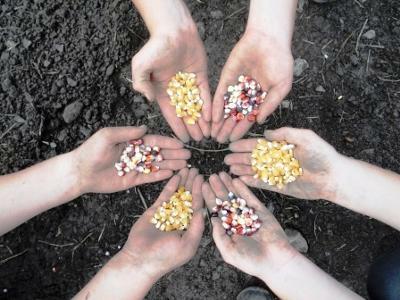 It is a method of growing which incorporates traditional ecological knowledge with whole systems design. The general idea is to become productive towards natural systems as opposed to continuing the strain of our current consumption cycles. 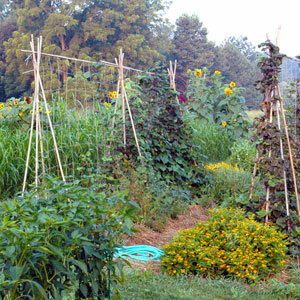 When beginning a permaculture garden, Laura noted the important things to consider include planning for future yields, diversity, input & output, energy, wild-soil, a multi-dimensional design, and relative location. Minimizing the amount of non-replenishing resources used such as petroleum based products and precious metals allow scarce energy to be redistributed towards other projects. Microclimates were also discussed as another aspect to consider when choosing the location of your plants. Laura emphasized, “If you have a corner of your yard that’s a bog or wetland, let it function as a bog or wetland.” It is almost instinctual to want to dig ditches or add soil from outside resources to change the landscape, but many plants love the excess moisture including rhubarb, celery, and fuki. One of the last things covered in the class was the invisible structures of permaculture. Cottage industries, intentional communities, political and monetary systems, and farmers markets are all elements that play a role in a successful permaculture operation. However, personal relationships, the most tangible and critical structure, was immediately present in the room of enthusiasts. At the end of her talk, the space was adherently fervent and ready to begin networking with each other and working together towards a common goal. I know its last minute, but if growing food in the winter has always sounded interesting but fear and doubt reigned heavier than a sense of adventure, now is the time to spread those proverbial gardening wings and attempt to fly! Sustainable Renton Community Farm is holding a Winter Gardening Workshop on Monday, September 23rd at 5:30 pm. This workshop will be led by Cascadia Edible Landscapes. These folks are a small, local company located in the Skyway area and are offering winter veggie starts for those that show up. It would be great to have a good turn out for these folks; however, they offer these starts to anyone who contacts them. Their website is www.eatyouryard.com . Some of the great things that can be grown in this area are most of the brassicas such as broccoli, cauliflower, and cabbage. Mustards as well as many different greens such as kale, collards, chard and bok choy are also good choices. Many varieties of lettuce, spinach, onions and peas can also be grown. 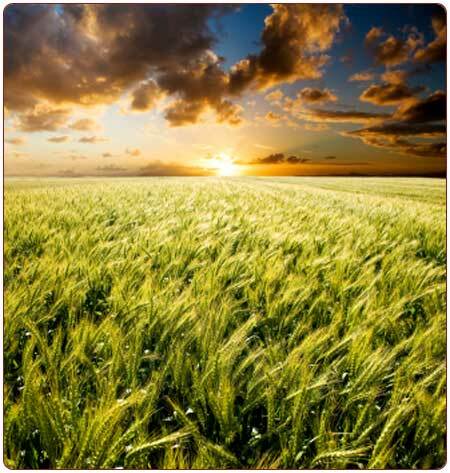 This comes as a relief because these crops are essentially the crops that have a tendency to bolt, with the exception of onions and peas, in the heat of summer. So come and check out Cascadia Edible Landscape’s collection and face those winter gardening fears this year. Also, if you happened to miss our seed saving workshop with the Urban Food Warrior, Caitlin Moore, you will have another chance to meet her in January with our Plan Your Garden Workshop-details to come within the next month. Also, there are four plots being used for pumpkin and squash beds, those plots will be coming available for new gardeners in the next months following the harvests. The price for a garden plot is $50 for a 12 month period. Posted on September 18, 2013 Author Sustainable RentonCategories Community Farm, Local Food System, WorkshopTags Community Farm, GardeningLeave a comment on Winter Gardening Workshop-This Monday! WOW! I was absolutely amazed at how wonderful the Pallet Shed Building Workshop turned out. 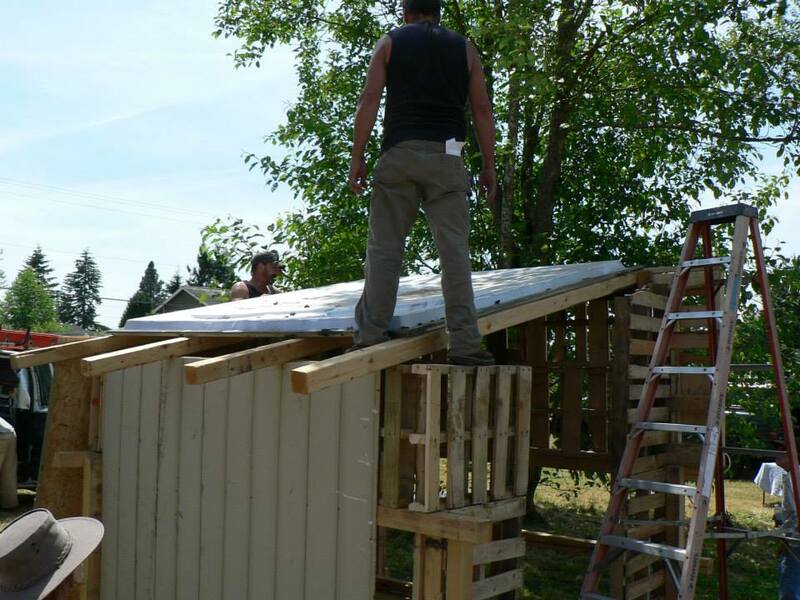 Not only do we have an amazing shed built out of Pallet Boards standing at the Farm site now, but everyone that attended the workshop chipped in to drive a screw, level a pallet, sturdy a ladder, or handle a skill saw. Steve and Kelvin Randolph (The Randolph Brothers aka Double Trouble) made it look fun and simple all at the same time. They did a great job fielding questions and giving answers that were simple and logical-it was a very user-friendly workshop filled with all the information anyone could need to build their own shed-complete with hands-on experience too! 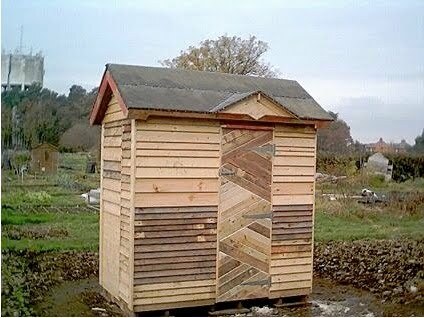 This shed was made with 100% recycled and donated materials. We were able to secure donations thanks to Eric DeShaw, Clayton Stiles, Mana Kashay, Jim and Debbie Doty, Steve Randolph and Commercial Building Maintenance. I am absolutely overwhelmed with the feeling of how necessary community is to a healthy and fulfilled life. With that comes a renewed passion for the efforts going into starting our community farm. There is such a beautiful reality emerging up here in the Renton Highlands and I am so grateful to be a part of it. Y’all ought to come up and take a look at how beautiful everything is here, also-we still have plots available! We are gearing up for some winter crop planting now so it’s never too late to get a plot and start the adventure of growing your own food. We have gardeners of all experience levels, there is plenty of help and information to be had so don’t be shy and come on by! 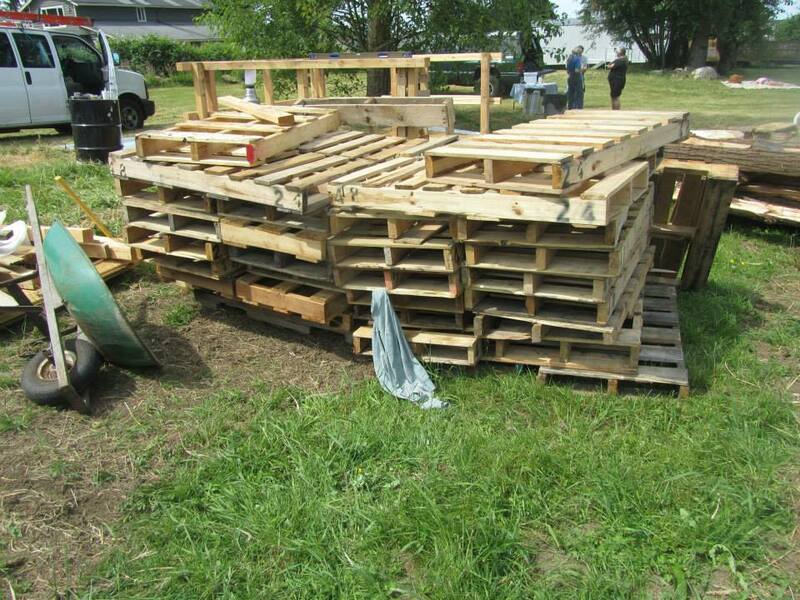 Posted on June 17, 2013 Author Sustainable RentonCategories Community Farm, WorkshopTags Community Farm, Education, Sustainability1 Comment on Pallet Board Shed Success! HEY FARMERS AND OTHER INTERESTED FOLK! 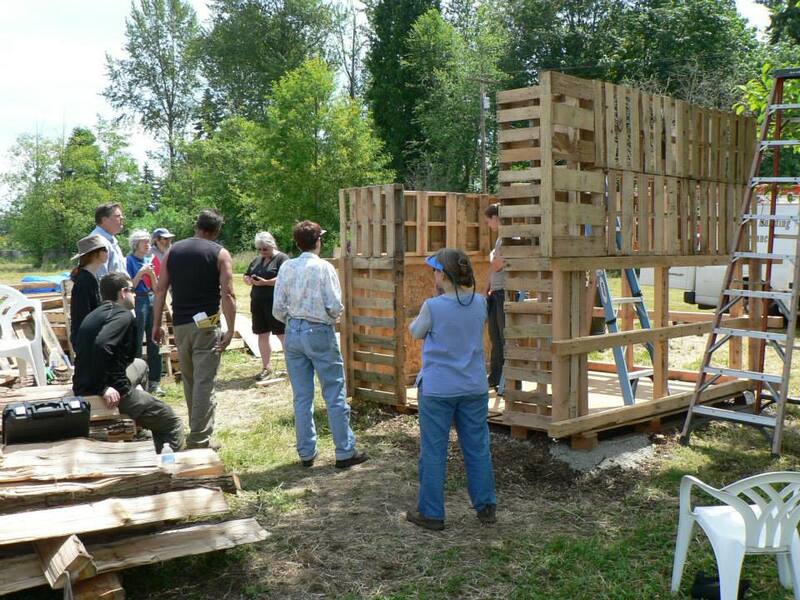 Sustainable Renton Community Farm is hosting a Pallet Board Shed building Workshop on Saturday, June 15th at 11 a.m. This engaging workshop will be held at the Farm property located just behind Celebration Church in the Renton Highland neighborhood at 11840 148th Ave. S.E. Come join us as seasoned carpenters, Clayton Stiles and Steve Randolph, walk us through the steps on how to build a functioning and CHEAP shed using mostly pallet boards. Bring your tool belts and come prepared for a hands-on experience. You may want to pack a lunch as the workshop will go through the lunch hour-and remember to bring enough fluid to keep hydrated in case the weather is hot. You can RSVP at the Facebook event page. Posted on June 10, 2013 June 11, 2013 Author Sustainable RentonCategories Community Farm, WorkshopTags Community Farm, Education, SustainabilityLeave a comment on Pallet Board Shed Workshop! I know this is a bit late but I wanted to put a word in about the success of our Seed Starting Workshop that was held in March. First of all I would like to thank everyone for showing up and to all who got the word out about the event. It was, by far, our largest turn out so far and we hope this trend will continue for our workshops in the future. Next I would like to thank Barb Mandic our resident Master Gardener whos presence is one of grace and wisdom. Also, a big thank you goes out to the ‘Urban Food Warrior’, Caitlin Moore, for her outstanding examples of seed starting techniques and her endless knowledge base of seed starting and how we can become closer to the sustainable lives we all want to cultivate. The fliers that were passed out from the workshop are being attached so those of you who could not make it can also have the information. Thanks again to everyone who made this evening a great success.